You need to get omega-3 fats from your diet, since your body can't make these essential polyunsaturated fats. Among the main sources for these fats are fish and fish oil, and flaxseeds and their oil. Fish oil and flaxseed oil contain different types of omega-3 fats and thus have different effects on the body. Learning about these differences will make it easier to choose the best way for you to increase your omega-3 fat intake. Fish oil provides the omega-3 fats eicosapentaenoic acid, or EPA, and docosahexaenoic acid, or DHA, while flaxseed oil contains alpha-linolenic acid, or ALA. EPA and DHA are the most beneficial of the omega-3 fats, but Americans don't get a lot of them in our diet, so our bodies also produce them from the more prevalent ALA. However, the conversion from ALA to EPA and DHA isn't very efficient, so Colorado State University Extension recommends increasing your intake of EPA and DHA instead of consuming more ALA. Taking 2.4 grams of flaxseed oil per day for 12 weeks can increase your blood levels of EPA and DHA, according to a study published in "The American Journal of Clinical Nutrition" in September 2008. However, for large increases in your EPA and DHA, you may need to supplement with fish oil, according to another study published in "Reproduction Nutrition Development" in 2005, which compared the effects of fish oil and flaxseed oil supplementation. People with schizophrenia or diabetes may not be able to convert ALA to DHA and EPA very well, and may need to get their omega-3 fats from fish and fish oil, according to the University of Maryland Medical Center. Fish oil may be better at reducing inflammation than flaxseed oil, according to a study published in "Cardiovascular Research" in February 2009, which found a beneficial effect only in rats given supplemental fish oil and not those given flaxseed oil. Another study, published in "Genes & Nutrition" in May 2013, found that while both fish oil and flaxseed oil supplementation lowered triglycerides and very-low-density lipoprotein levels and increased beneficial, high-density lipoprotein, or good cholesterol, they did so via different methods. DHA, found in fish oil but not flaxseed oil, is the type of omega-3 fat needed for proper brain and eye development in infants and which is being investigated for potential benefits for Alzheimer's disease and rheumatoid arthritis. The University of Maryland Medical Center also notes that while fish oil may decrease your risk of prostate cancer and macular degeneration, flaxseed oil may have the opposite effect. While flaxseed oil is generally safe, consuming more than 30 grams a day may cause diarrhea, according to MedlinePlus. 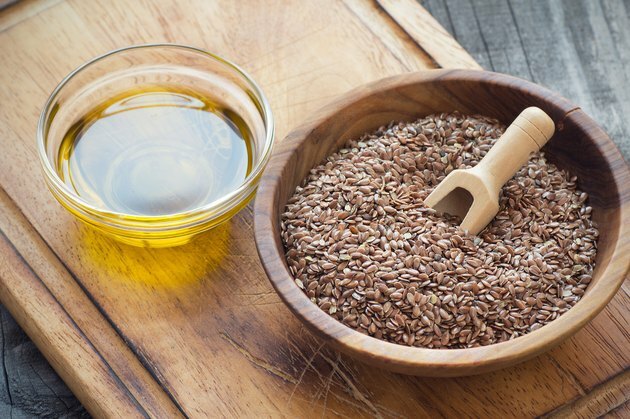 Pregnant women should avoid flaxseed oil, since it may increase the risk of premature birth, and those with bleeding disorders should avoid flaxseed oil, since it may have a blood-thinning effect. Fish oil may increase your risk of bleeding, increase your blood sugar levels and cause gas, belching, diarrhea and bloating. Both flaxseed oil and fish oil may decrease the absorption of medications if you take them at the same time, and may interact with blood thinners, cholesterol medications, diabetes medications, topical steroids and NSAIDs, notes the University of Maryland Medical Center. Can I Take Flaxseed Oil & Fish Oil Together?